I've been familiar with the Pie Plante trailer for a little while now, as it is parked in the same lot as my Moroccan friends, the Flying Carpet (504 W. Oltorf, next to Church's Fried Chicken). 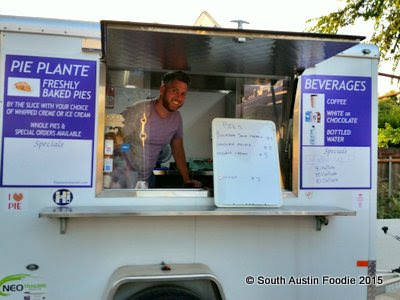 Owner Mark Plante is a self-taught baker who saw the need for pies in Austin (yes! ), and has been in business for almost a year. 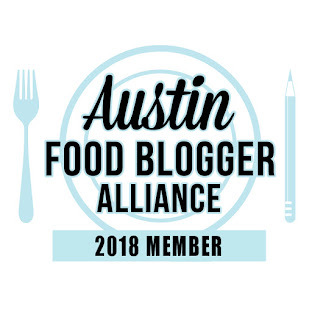 He invited a few bloggers out last week for an informal gathering, a mini pie social if you will! I was not asked for nor financially compensated for a blog post, and all opinions are my own. 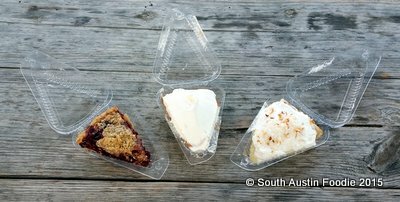 The trailer usually has three to four selections daily, and a slice of pie is $5. Whole pies are available by pre-order, and range from $32-42 (contact Mark for additional varieties). And remember, whole pies aren't just for the holidays! 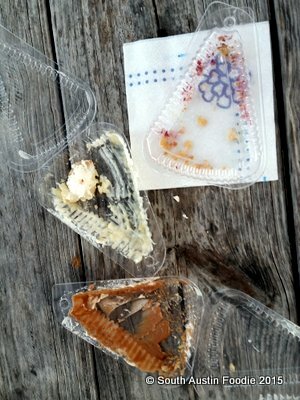 Today's selections were: bourbon sour cherry, chocolate mousse, and my obsession, his coconut cream pie! The cherry pie was loaded with fruit, and had a distinctive, but not overpowering bourbon taste. I am not as much of a cherry or berry pie fan, but this was outstanding, and had a crumb topping. Vanilla ice cream would be an excellent addition! The chocolate mousse was nice and light, and there was no cloying sweetness to it, while maintaining a good chocolate flavor. And finally, the coconut cream. To me, it's perfect. 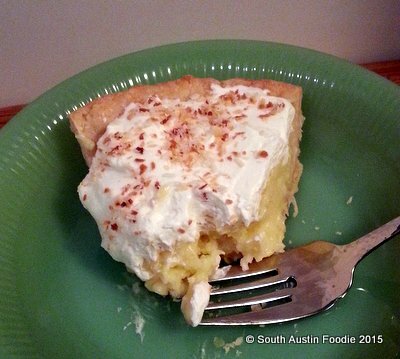 A smooth custard filling, whipped topping, and toasted coconut flakes on top. The coconut definitely has a presence, you don't have to second guess what kind of pie you're tasting! Here's a picture of it that I took last November when I took a slice home. This is owner Mark in the trailer. He'll be taking a vacation (and staying out of the August heat!) here shortly, so keep your eye on his Facebook page for hours. He also updates his daily pie selections there too. And in case you need more evidence that the pies are fantastic. We licked these clean! So stop by Pie Plante and either eat your pie there, or take them home, but you won't regret it! 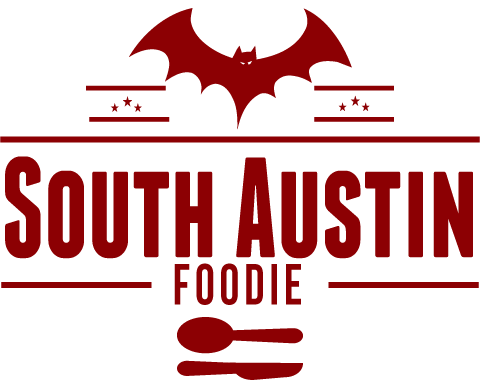 The bourbon sour cherry will also be available by the slice at Farm to Market Grocery starting this month!